High performance commercial urethane finish layer for protection against scratches, scuffs, stains and wear. Heavy-duty embossed 20 mil wear layer prevents rip, tears, gouges and indentions. Print film layer for a beautiful and realistic designs. FibercoreTM stability layers for industry leading dimensional stability. 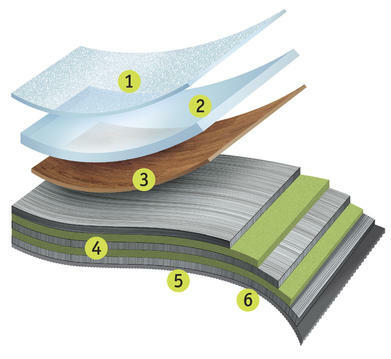 A uniquely sculpted wave backing system allows air and moisture in the subfloor to breathe. Pre-applied, re-positionable, pressure-sensitive adhesive, so no glue is required. Adaptt LVT with SureSet™ technology is designed to drastically reduce the time and expense of your next floor installation. A unique sculpted wave backing system allows air and moisture in the subfloor to breathe, so Adaptt can be installed directly over the subfloor without an underlayment. Pressure-sensitive adhesive is pre-applied in the factory, so no glue is required on site. Tiles and planks stay in place, yet can also be repositioned when necessary, making installation quick, easy and flexible. Adaptt is a solution for high subfloor moisture, the need for immediate occupancy and lower maintenance costs. Adaptt's superior backing system with pressure-sensitive adhesive is approved for application up to 95% RH*. When used in conjunction with Tarkett's SureStart underlayment Adaptt is approved for applications up to 99% RH*. Once Adaptt has been installed in your space it is available for immediately occupancy reducing the cost of downtime which makes it ideal for commercial applications. Adaptt is protected with a high performance commercial urethane finish that enhances durability, clean-ability and lowers maintenance costs.